Most of the millions of devotees who visit the Tirumala Tirupathi Temple every year,vow to walk through the entire range of the sacred Seven Hills of Tirumala to reach the main Tirumala Temple..Called pada yatra this is a very hazardous journey that passes through the beautiful and colorful jungles of the Tirumala hills..Many devotees intentionally choose this devotional method to please the Holy Lord Sri Venkateswara ..
All these devotees believe “..it’s auspicious to walk through these sacred seven hills of Seshadri,Neeladri,Garudadri,Anjanadri, Vrishabhadri,Narayanadri and Venkatadri before having the darshan of Lord Sri Venkateswara..There’s also much truth in this belief as this strenuous effort by His devotees,to have His darshan,immensely pleases the Holy Lord..
Just about a few meters away,right in front of the Mahadwaaram of the Srivari Temple,is located the famous temple of Bedi Hanuman – also known as the Bedi Anjaneya temple – and the grand stand of Akhanda Jyoti..
However,there’s an interesting story behind this Hanuman Temple that also tells us why Lord Hanuman,the presiding deity of this Temple,is called Bedi Hanuman here.. But Lord Sri Venkateswara Did Not Neglect Bala Hanuman,His Ardent Disciple.. 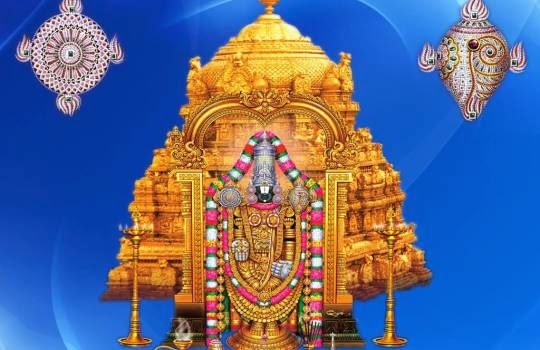 Watching His beloved disciple standing all alone in front of His Temple,Lord Sri Venkateswara instructed His Temple priests to offer timely food to Bala Hanuman each and everyday and take good care of Him until His mother returns.. It is for this reason alone that every time neivedyam is offered to Holy Lord Sri Venkateswara and Varahaswamy everyday,the same naivedyam is brought to this temple and offered to Lord Hanuman..
After finishing the pada yatra ,it’s also auspicious to visit this Temple and offer Bala Hanuman our thanks and seek His blessing for giving us the strength to climb the seven hills..With this intention many devotees visit this Temple and offer their thanks to Bala Hanuman..
There’s also in front of the Mahadwaaram of the Srivari Temple ,the Akhanda Jyothi more popularly known as “AKHILANDAM”, the ever burning oil lamp..Scores of pilgrims,after walking up the seven hills,visit this Akhilandam; break a coconut there; light a camphor and end their pada yatra..